The bike wheelies soooo bad. I was finally able to change my position and keep it down somewhat, early in the day was just a stunt show for me going down the track. Foot shifting,Stock wheel base and no spray. The DA today was good for us at 4312ft the only bad part was the 10mph head wind. We started useing http://www.dragtimes.com/da-density-...calculator.php for everything now that they added roswell nm to the list. Last edited by jlewis_02; 03-09-2009 at 11:41 AM. I got some parts coming in the next few weeks that should put me around 10.05ish or so without spray. What extensions will work for the fz1.my son just ran a 10.33.my bike is lowered and strapped.also just have a 16tooth on front ,rear is stock. R1 parts will fit. I believe you need to swap to the smaller R1 brake rotor as well along wih the usual longer brake line/chain. Your son can ride that thing pretty damn good BTW! Thanks! !Yeah I had to work so I couldn't go watch but I will in 2 weeks.I was gonna sell the bike but I think we are gonna play at the dragstrip for awhile. What header do you think makes the most power? If you just want to buy a header only, the only two companies that sold/sell them alone are Micron and Dale Walker (Holeshot). I went to the track this weekend with all the new parts and a new clutch I really hate new clutches.I have to get used to it again now dang it. Anyway I ran a best of 10.29@135 with a 1.81 60'.I will get the 60's back into the 1.6s or lower in the next few trips I hope. 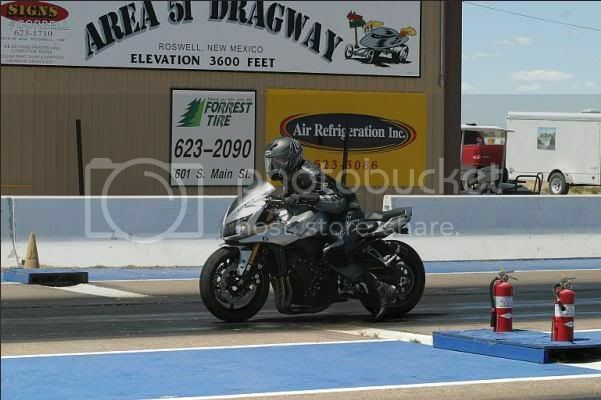 Here is a pic taken at the track. Holy hell that bike is low! Looks great though! Im going back to 15/45 gearing as im shifting into 6th just before the 1/4mile line. Ah, so you shift a little sooner? I have 15/45 and am shifting 5th-6th RIGHT at the traps. I was going to 16/47 when do my 520 kit. Should I go 16/46? 16/46 will prob be the right combo for ya. That's what I was thinking of doing, or going to 15t front I just dont want to shift right at the traps. I'll be going again this Friday for the first time since my last visit. Going to try and knock of a 9sec pass with the 16t for now. I just need that 1.6 60'. Well guys wish me luck. I'm heading to the track tonight, wish it was cooler. Ill try and get a video seeing as my 10.38 pass was kicked off the list. I've still got that slip but its hardly readable. Going for low 10's ;). Gotta get that 1.6 60ft! Heading to the track in 2 weeks for my 1st run on the FZ, probably going to start out a little conservative but I'm hoping to get into the 10's by days end. I'm wondering what tire pressure do you guys run and does it make any difference. I'm at 40rear 36front, but never really break loose, more problem with wheelies than anything else. Thanks, and those are some impressive passes. Hope to post some of my own soon!